Fine fuzz at your disposal in a variety of tasty flavours. Great build quality. Extremely wide range of fuzz tones. 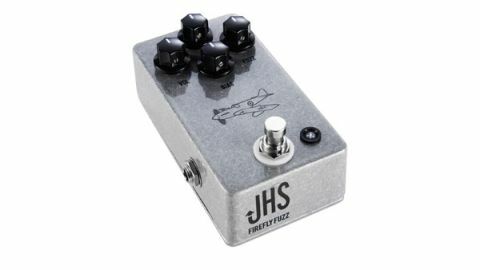 The Firefly, from US effects firm JHS Pedals, is a souped-up Tone Bender. More specifically, JHS says that it's a tribute to the three-knob MKIII from the late 60s and is based around a trio of hand-matched germanium AC128 transistors. Where the original had controls for Fuzz, volume and EQ, JHS has added a Bias knob to fine-tune the power to the transistors. "By juxtaposing the knobs, you get an extremely wide range of fuzz tones"
All the knobs are interactive - tweaking one influences another - but it's the Fuzz and Bias knobs that are the real tone shapers. With the Fuzz knob fully clockwise, it's all smoothness and fatness, but wind it back and you'll lose the low and midrange body for a real trebly, sharp-edged ripping fuzz. The Bias knob lets you focus further, and turned clockwise, delivers a more edgy rasp. By juxtaposing the knobs, you get an extremely wide range of fuzz tones. If you're looking for a fuzz box but are worried about being stuck with one sound, the versatility here may solve your dilemma.